You are here: Home / Kitchen / Can the scratches in my Corian countertop be sanded out? Can the scratches in my Corian countertop be sanded out? When you built your home ten years ago, you selected Corian© countertop for your kitchen because they are easy to clean and keep clean, are resistant to stains and heat, and have nearly invisible seams. Additionally, you were told they could be repaired. 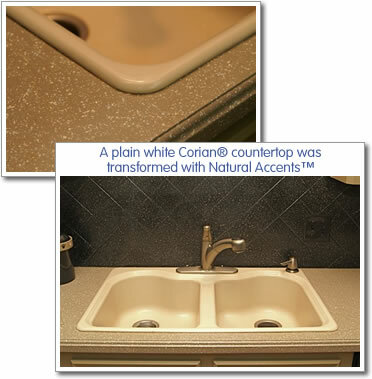 Ten years and lots of use later, you’re noticing that your Corian© countertops have seen better days, especially that area where those scratches mysteriously appeared (well… kitchen mishaps do happen!). You remember that your Corian© salesperson said that the countertops can be repaired by sanding the blemishes or scratches out. An almost unlimited color and pattern selection. Whether your Corian© surface is gouged, burned or you’re just tired of the look, call Miracle Method at 855-212-7337 or use our online locator today to find the franchise near you! You’ll be amazed at what you can do and how much money you’ll save. That’s one of the things I love about corian countertops. They can be so easy to repair and replace if necessary! I’m planning on having them used in the kitchen of my new home. Thanks for sharing! I noticed some scratches in my Corian countertop. I want to make sure that I get it fixed! The only problem here is that I don’t have the sanders required to fix it myself. I’ll be sure to get a professional to can do it for me! Thank you for your interest in Miracle Method, we can repair and refinish your Corian countertops to look and feel like new again. To obtain a free estimate contact the franchise nearest you. You can find their contact information on our website. Go to http://www.miraclemethod.com and click on “Find Your Nearest Miracle Method” or you can reply with your zip code and we’d be happy to provide the contact information for you. This is great stuff. 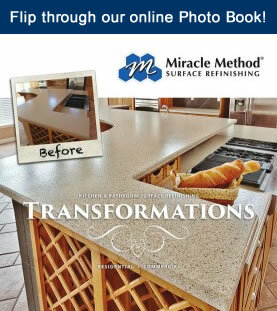 We’re going to recommend the Miracle Method to our customers when they call with an issue about scratches on their countertops.